A huge well done to Paul Manwarring for passing his DAS first time round following his 3 days training with us. 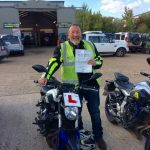 Big smiles here from Paul who travelled down from Dorking each day, but it was worth it now hw has his full bike licence hey Paul! Ride safe and we will see you in the future on your Triumph Bonneville or Ducati Scrambler maybe? mmmm decisions decisions!